of the illuminated animal books of all times . The number of copies published cannot be thought of small enough. And only seven years after the publication of the Animal Kingdom with Martin Elias the one of the two sons more familiar with the work died. with margins on three sides c. 2-3 and below c. 4.,5-5 cm wide. Multiple-sheet items running under one number – here thus pendants and thematic en-bloc groups offered as option and by themselves alredy favorably priced – therefore always also count as one item. For plates joined in the latter applies besides: no time-limited shipping discrimination for orders of but individual plates. Elephant. Elephant. – Th. 1030. – A tiny brown spot in the white plate field top left. An Elephant. Un Elephant. 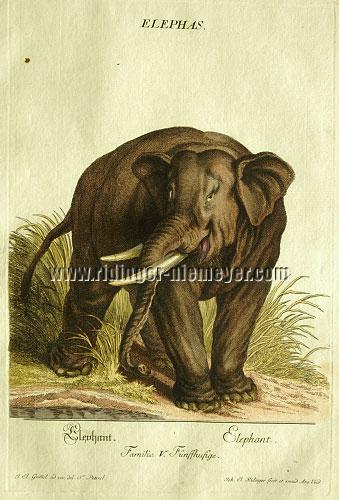 “A female animal, yellowish grey, passing into blackish grey … mighty tusks” (Th. 1031). – Quite dainty pleat in the left white plate field. In the lower far white plate and adjoining paper field one tiny brown spot and 1⅛ × ⅜ in (3 × 1 cm) brown streak each. – See the complete description. Trained Elephant. Elephant dressé. The mounted driver became victim of the shortening of the plates – “what looks bad” (Th. 1032) – in the uncolored 1824/25 new edition. – Margins on three sides 1.7-3.5 cm, below 4.6 cm wide. – Two little brown spots in the upper white plate field. – Beside the “Crane at Oldenburg” the prime plate of the set. – See the complete description. The Horse. Le Cheval. Partly spotted bay stallion standing to the left. – Th. 975. – Old backed tear of 13 cm visible above the horse within the foliage and white plate/paper margin field resp. and outside of the actual subject also otherwise slightly agemarked. – See the complete description. Hinny, loaded Mule. Le Mulet chargé. “Splendidly decorated and heavily loaded with driver” (Th. 983), drawn from life, walking to the right. Ditto loaded Mule. Le Mulet chargé. Again decorated, highly loaded with feathered ones and lambs, to the left, going down a slope. – Th. 984. – See the complete description. The Large or Miller’s Donkey. L’Ane de Meunier. Staked in landscape, standing to the left. “A well-made figure, ash-grey with black lower back and cow’s tail” (Th. 981). African Donkey ( recte Zebra , so also the Latin designation ZEBRA vel ZECORA ). Ane Afriquain. 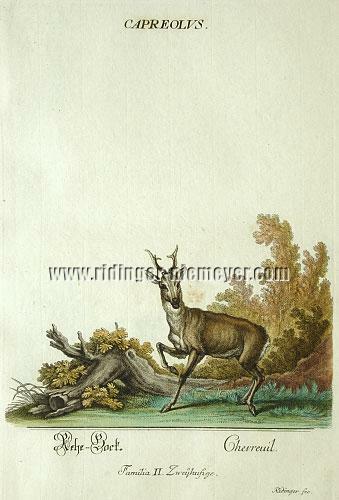 “A quite nice representation of this fine animal as it trots (to the right). The stripes black-brown, as they are usually” (Th. 978). – See the complete description. – – ZEBRA vel ZECORA. Ane Afriquain. Lying to the left. “These names are all wrong. 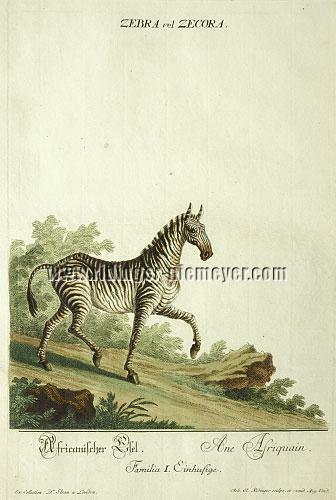 We have here the quite well-made illustration of Equus Quagga, which is similar to the zebra, but is essentially different already by color as belly and hands always show white” (Th. 980). 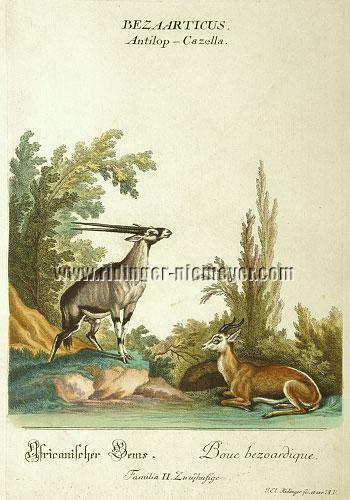 – – Early representation of the quagga of the South African plains, described first only 1778, extinct already 1878. – See the complete description. Aethiopian Donkey. Ane d’Ethiopie. 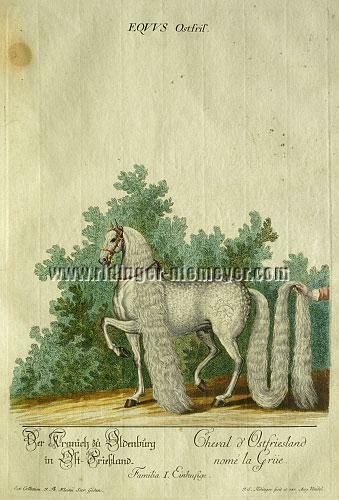 “It is nothing but a zebra which, however, worked from inaccurate drawings, turned to horse-like long-necked. The stripes are auburn” (Th. 979). Trotting vivaciously to the left in front of dark wall. – See the complete description. 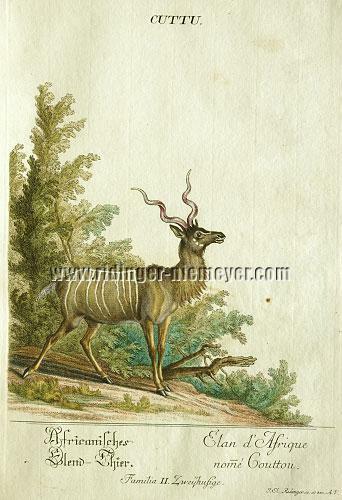 A yet promised African Donkey ( recte young zebra, “worked after inaccurate drawing”, Th.). Ane africam promis. Vn cheval velu. The former standing to the right, next to it the latter with halter, lying to the left. – Th. 977. – Tiny brown spot in the white text field. The Crane at Oldenburg in East Frisia. Cheval d’Ostfriesland nomé la Grüe. The world’s most famous dapple-grey horse, the Crane at Oldenburg in East Frisia, with the brand – A in 8-pointed star below crown – of his master, Count Anthony Günther of Oldenburg and, from 1647, Delmenhorst), a horse lover of degree. – Th. 976. – Upper left in the white paper margin/platemark ¾ × 1⅝ in (2 × 4 cm) brown spotted, otherwise isolated little brown spots in the white plate field and the white margin resp. only, the latter below right also with thumb stain. With Jacob Theodor Klein (“Plinius Gedanensium”, Königsberg 1685 – Danzig 1759; town clerk in Danzig, later director of the Society of Naturalists Danzig co-founded by him, member of the Royal Society, London, and honorary member of the Russian Academy of Sciences in Saint Petersburg; ADB XVI, 92 ff. 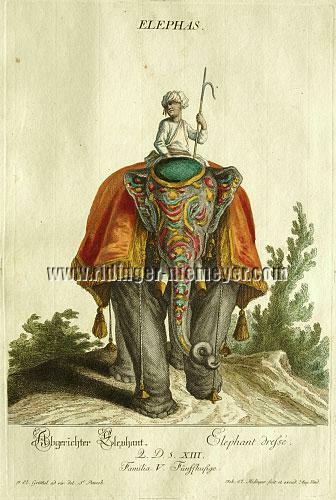 ), famous for his collections, Ridinger was in close communication and supported in his Colored Animal Kingdom undertaking in many ways, too. Following Klein’s classification according to kind and number of extremities – superceded by Linné’s anatomical classification – the early states of some plates of the set still show references to his Quadrupedum dispositio brevisque Historia Naturalis of 1751, as known to Thienemann for some plates and documented here for several more by a complete copy available here. Ridinger himself emphasizes by the preface in his words of thanks “in particular the tremendously beautiful collection of P(rofessor). Klein of the Ludolph estate, which comprises nothing but original items”. – See the complete description. The Doe, Goat. La Chevre. With collar & bell, standing to the left. – Th. 997. – Little brown spot in the white paper margin lower left and several tiny brown spots in the white plate field. Billy Goat. Le Bouc. Splendidly cornuted, slightly going to the right, looking at the beholder. – Th. 996. – Some little/tiny spots in the white plate field. Arabian Buck. Bouc d’Arabie. Silverbrown longhaired with horns curved far to the behind, standing to the left. “I know to say about this variety nothing but … ” (Th. 998). – Quite isolated tiny brown spots in the white plate field. – See the complete description. Hungarian or Bohemian Sheep. Belier d’Hongrie ou de Bohème. Iridescent deep brown, with turned horns, lying to the right, yet looking to the left. “The rakka Aegoceros ovis” (Th. 994). – See the complete description. 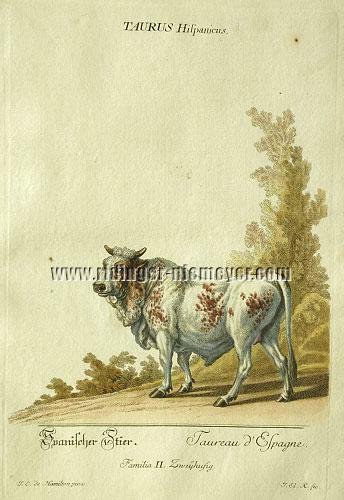 “It yet follows … and these are the Spanish bulls, the illustration of which we owe to the kindness of Mr. Hamilton in Vienna (supposedly the imperial court painter Johann Georg de H., Brussels 1672 – Vienna 1737, nevertheless inscribed by Ridinger as “J. C.” de H.). It is not easy to find a more splendid growth . are held with them, in which the Spaniards hold a regular duel with these animals on horseback and on foot in honor of their mistresses, whereat quite many a one has lost his life” (preamble by Ridinger’s sons). – Isolated tiny spots in the white platefield. – See the complete description. Herd Bull, Hage, House Bull. Taureau. Vigorously standing to the right. “Dark reddish brown, belonging to the Swiss Race” (Th. 985). The Elk. Un Eland. “Male striding (to the left), female lying (to the right), brownish black” (Th. 1014). African Elk. Elan d’Afrique nomé Couttou. Standing to the right. – “What Ridinger describes (in the preamble) as African elk, is … nothing but the Greater Kudu” (Th. 1002). – See the complete description. The Red Deer. Cerf. 18-pointer recumbent to the left. “… tawny, above changing into rust-colored, below into dun. Looks quite good” (Th. 1005). White Spotted Stag. Le Cerf tacheté blanc. 16-pointer recumbent to the left. “Light ocher drawing into the grey, dun-shaded” (Th. 1007). 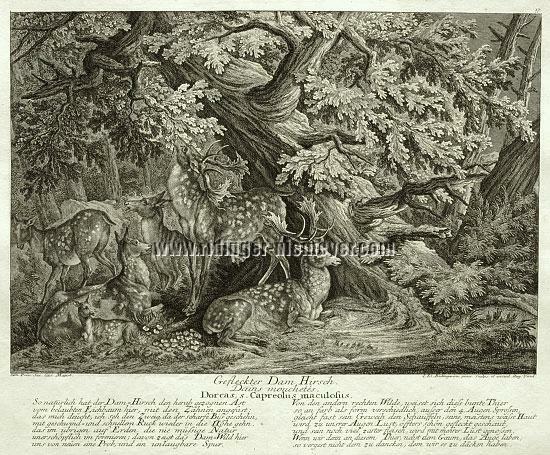 – State with the modified caption after the removal of the reference to Jacob Theodor Klein’s Quadrupedum dispositio brevisque Historia Naturalis of 1751 as mentioned by Thienemann as missing “on some plates”. – See the complete description. 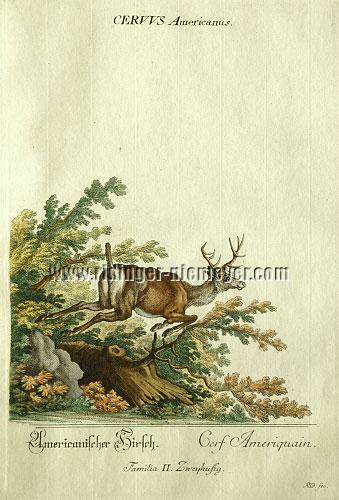 Stag Lighter or Yellowish. Cerf jaunâtre. Odd 18-pointer recumbent to the left. “… light ocher shaded darker, below and in front all over light grey” (Th. 1006). Deer, Hind, Game. Biche. “Hind … Lying (to the right), brownish yellowish, below grey” (Th. 1008). – See the complete description. African Deer from Guinea. Cerf Afrique. Brown shimmering, white spotted 6-pointer standing to the right. – Th. 1010. – Interesting sheet. 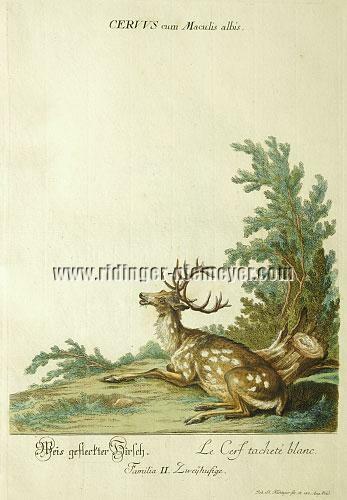 “ Thus the provider of the text to the new edition (from 1824/25, remained uncolored) considers him, just like the (following, American one), only as a variaty, climatic deviation of the red deer. That this one, which is done from a drawing by the famous Vienna court painter (Hamilton; supposedly Philipp Ferdinand, 1664 [?] 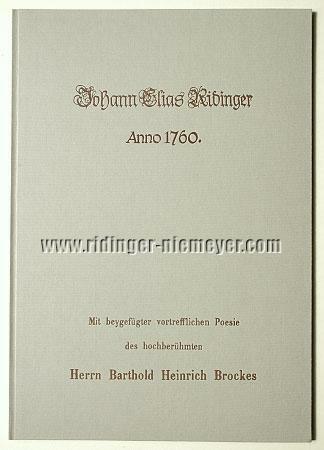 – 1750, yet inscribed by Ridinger as “J. 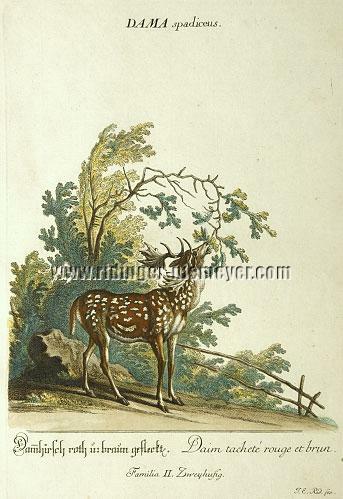 P. de Hamilton”) should not be, as already his quite deviating antlers show. However, I am not able to name the species to which it might belong to. ” – See the complete description. American Stag. Cerf Ameriquain. 12-pointer “All flighty … dark reddish brown, head and neck grey, the tail a strange stub, otherwise equaling the red deer. The drawing unfortunately just from the description of a traveler, therefore fantasy. By the way there are quite a number of kinds of deer in America, therefore also the name ‘American Deer’ is to be dismissed entirely.” (Th. 1009). Nevertheless – splendid sheet . – See the complete description. 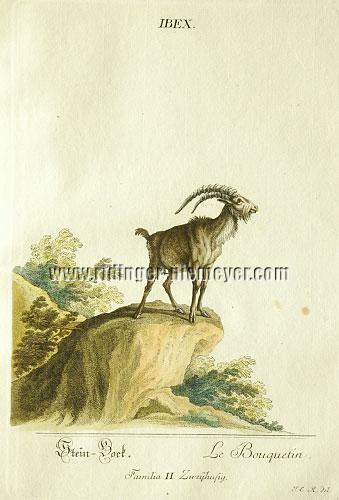 African Chamois recte Antelope Gazelle. Bouc bezoardique. Standing to the right the one, resting to the left the other. – Th. 1001. – Painterly fine . From the point of view here finicky, without regard for the painterly pictorial effect if necessary always attained by scenery, illustrative here not least of just the “Little Buck”. 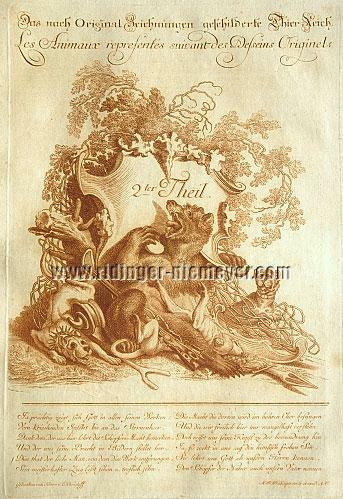 A platework simply requires the uniform format and the connoisseur values its generous design and just for this dismisses the trimmed down, uncolored new edition of the 1820s, of which Thienemann (page 200) says many plates would look better now, yet has to admit that “also at the same time many tops of trees and shrubs, many decorations, indeed some animals had been taken away, too”. Indeed. One cannot have both at the same time. – Acid-freely backed fine trace of a tear of 4 cm within the left far part of the white paper margin 5.5 cm wide. – See the complete description. “Ridinger says that he had received three illustrations which were in exact conformity with each other. The name Civette is utterly inadmissible.” The latter here corrected within the caption to Musc as unbeknownst to Th., that is MOSCHIFERVS. / Bisem-Thier. / Musc - / Familia II. Zweÿhufig. – See the complete description. Porcupine, Hedgehog. / A Mole. Porc epic. / Mas. The former in irritated state, raising the spines, towards the zeitgeist. The latter as representation rare & wanted . – Th. 1051. White Fallow Deer. Daim blanc. Tame fallow deer with collar & bell crowned by splendid palms, in a park striding briskly to the left. – Th. 1018. – Marvelous sheet . – See the complete description. Fallow Deer Spotted Grey. Daim tacheté gris. Recumbent to the left, but calling to the right. Light grey on white, antlers painterly fine. – Th. 1017. – Marvelous as before . Fallow Deer Spotted Red and Brown. Daim tacheté rouge et brun. – Th. 1015. – Painterly fine . Fallow Deer Female. La Daine. 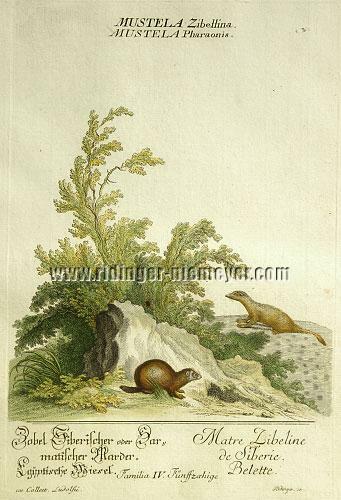 “Recumbent (to the right), dark brown, below light reddish brown passing into white, tame, with bell collar” (Th. 1019). Fallow Deer, Spotted. Daim tacheté. Striding briskly to the right, but stopping short, looking back. “Spots blackish-brown on whitish ground” (Th. 1016). Roe Buck. Chevreuil. Dark colored in slight position ready to leap off to the left, but stopping short looking at the beholder. – Th. 1020. – See the complete description. Roe or Doe. Chevrette. “Standing in the water (to the right), light ocher. 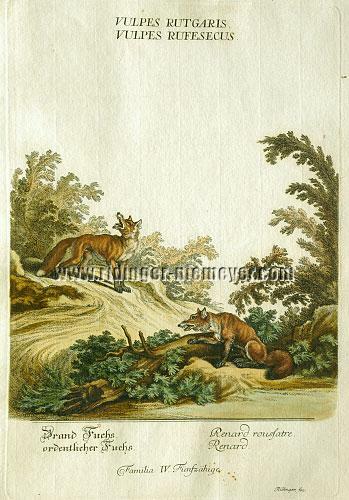 The original drawing copied in our work (original edition) in aquatint manner” (Th. 1022). – See the complete description. Spotted Roe Buck. Chevreuil tacheté. Yellowish brown with white spots recumbent to the left, looking at the beholder. – Th. 1021. – See the complete description. Chamois. Chamois. Grunting buck to the right. – Th. 1000. Ibex. Le Bouquetin. Majestically to the right. – Th. 999. – See the complete description. Thienemann lists the dominant rare Axis deer only following no. 1000. – See the complete description. Musk Boar. Porc d’Inde. The Indian Musk or Javelina Pig , as such nevertheless rejected by Thienemann: “Yet what this curiously cubed pig should mean I cannot discern by any means.” Before landscape scenery standing to the right. – Th. 1026. – See the complete description. Buffalo Ox, the Larger. Buffle. Great common buffalo with nose ring, looking to the left. “The position from dead behind not well-chosen” (Th. 990). Common Brown Hare. Lievre. 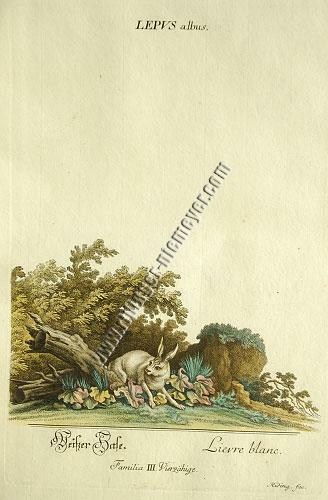 “A nice picture, in fitting environs Master Hare sits in the midst with the head turned sideways (to the right)” (Th. 1043). – See the complete description. White Hare. Lievre blanc. Coming from undergrowth, scenting to the left. “White it is in the winter coat, otherwise it resembles the common one, and represents an own species which lives in the Alps” (Th. 1044). – See the complete description. DJM 5912 with illustration page 158 merely from the uncolored new edition of the 1820s. – “The cornigerous hare goes about like a ghost in our hunting literature since 1602. Quite nice, too, what Mr. Buffon knows to tell about: ‘Sometimes lawless nature brings forth against her practice cornigerous hens, hinds, and does, therefore supposedly also cornuted or deer hares … and Balbinus ascertains in Norway it were not entirely uncommon to see suchlike animals’ …” and in 1798 also the famous Electoral Hesse head forester von Wildungen has shown himself converted from his original disbelief. – See the complete description. Rabbit, Coney. Le Lapin. “A pretty group of five, quite different in size and color …” (Th. 1046). – See the complete description. The Hedgehog. / Guinea Pig. / The Marmot. Herison. / Le petit cochon d’Inde. / Rat des Alpes. “The animals again too small …” Th. 1049 nags. – The former & the latter as representation rare & wanted . Dark Squirrel Ditto Light one / Flying Squirrel / Rats. Mice. / Bats. Ecuriel tan(n)e. Ecuriel brun rif. / Ecuriel volant. / Le Rat. Les Fouris. Also by the rich accessories a happy jumble. The two rats as black and brown Norway rat, of the house mouse even four mercurial ones. The two long-eared bats shown here top right in small, the one from front, the other from behind, dominate in the same position Th. 378 as the of old highly paid “Extremely rare” sheet XXXV of the Incidents set concluded 1779. They then also impart the present sheet its weight. – Th. 1047. – See the complete description. Eastern Chipmunk. Ecurieu raÿé. Cracking nuts beneath trees. – Th. 1048. – Really tiny faint brown spot at the far left white lateral margin. – See the complete description. Ferret. / Ermine. Le Furet. Armeline. – Th. 1052. – See the complete description. The sable “is the most like the pine marten among the relations of the species … The shining silken coat, which is regarded already of old as the most precious one among all the furs, costs the more the more unicolored it is … Most common it is presently still on Kamchatka where the almost inaccessible mountains provide refuge. In regard of its habits it is like our pine marten” (Meyers Konversations-Lexikon, 4th ed., XVI , 948 f.). The present one of the preferred chestnut and darker color with relatively little white. – Tiny brown spot showing from the back within the shrubbery. – See the complete description. ordinary Wolf. / completely white Wolf. Loup ordinaire. / Loup blanc. Really painterly arranged “quite nice sheet on which we see above the entirely white wolf lying (to the right) and howling, below a regularly colored, emaciated one, standing (to the left)” (Th. 1062). – A little wax spot on the back showing through quite feebly above in the white plate field. – See the complete description. African Wolf. Hyéne d’Afriquè. The striped Hyena. “It has a skeleton before it and gnaws at a bone. That it is more ferocious than the wolf is not true. Being more cowardly, it mostly feeds on carrion” (Th. 1064). – Small faint trace of brown below the Y at the top edge inscription, otherwise enviably impeccable. – See the complete description. Red Fox. / ordinary Fox. Renard roussatre. / Renard. Quite painterly arranged sheet. Above one standing to the right, yet barking to the left, below one half lying to the left. “Quite appealing. It has been said repeatedly before that the foxes designated here as different species belong to one species” (Th. 1063). – See the complete description. Wildcat or Male Cat. Chat souvage. “Again a quite appealing sheet. The one cat eats a woodcock … the other is about to leap down and assist” (Th. 1069). – See the complete description. Cat Lynx, Mountain or Stone Lynx. Loup cervier. “Below a strongly spotted bobcat, recumbent (to the left looking at the beholder), above a caracal (Turkish: black ear) … from Persia or Arabia lurking. It is then a quite well-made illustration … ” (Th. 1070). – Small weak spot accompanied by faint stain in the lower platemark as a precaution backed acid-freely. – See the complete description. The White Spitsbergen Greenlandic Bear. L’ours blanc de Grœnland. “Standing, the jaws wide open. 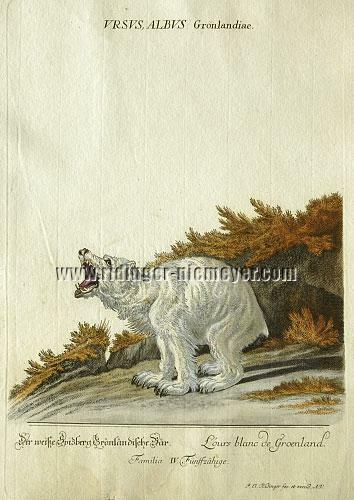 Why in the (N)ew (E)dition it is considered against Ridinger as just a white variety (‘The White Land Bear’) and not the Polar Bear (Ursus maritimus) I do not know” (Th. 1082). – Fine sujet . – Hardly worth mentioning a faint tidemark in the lower white plate/paper field. – See the complete description. The Brown Bear. Ours petit roussatre. Sitting, looking at the beholder. “Now and then it shall occur in Switzerland in this quite peculiar (russet) color. Position like the Greenlandic Bear No. 527., only reduced” (Th. 1081). – In the lower white plate/paper field hardly perceptible tidemark. – See the complete description. The Great Black Bear. L’ours grand et noir. Tamed, with nose ring and head strap in slightly bent position to the right. – Th. 1079. – Faint tidemark in the lower white plate/paper field and two faint (little) brown spots in the white plate field right. – See the complete description. The Great Brown Ant-eater. L’ours grand et brun des fournus. Looking out of the picture, he sits “before a herd of ants and licks the same off its paw” (Th. 1080). – Faint tidemark in the midst of the lower white plate/paper field and two narrow brown streaks below in the right white lateral margin. – See the complete description. “(The glutton) inhabits the North of the Old and the New World, previously it was found southerly up to the Alps, now (1890) only up to southern Norway and Finnmark; it prefers the bare heights of the mountains … is enormously strong and wild and in danger it offers resistance also to men … according to others (its name) origins (from the Swedish) Fjäl-Fräs and means rock cat.” – Once limited to North America and there once “largely repressed by chase” the raccoon of the family of the bears now since long a fellow member over here, too. – Quotations from Meyers Konversations-Lexikon, 4th ed., XVI, 196 f. and 406 resp. – Faint tidemark left/center of the lower white plate/paper field. – See the complete description. Bactrian Camel. Chameau Bactrien. IN AUGSBURG DRAWN FROM LIFE . AND HIS DRIVER RESCUED FROM HIS MURDEROUS VIOLENCE ! Dark-colored two-humped one with halter, standing to the left. – Th. 1034. – Two little brown spots in the 5 cm wide white lower margin left, isolated tiny spots in the white plate field. Dromedary with Two Humps. Dromadaire avec deux bosses. Light ocher colored, about to lie down to the left. – Th. 1035. – Instructive sheet . – See the complete description. Th. 529-534 in black & white , which to get possession of had the current Ridinger collection dig deep into its pockets in the mid-90s by acquisition of one of the two Pompadour albums here of Baron von Gutmann’s (Schwarz) legendary Marjoribanks Folios to finally close this decades-long nagging gap. “A well-done representation of this American animal rarely to be seen over here … a llama which is found in freedom from times immemorial” (Th. ), “has been reduced considerably due to hunting” (Meyers Konversations-Lexikon, 4th ed., X , 420/I). – See the complete description. Hippopotamus, River Horse, Water Ox. Cheval marin. – Th. 1029. – At the upper left white stitching margin some small brown spots. Ox. Boeuf. Off-white draft bull lying to the right. – Th. 987. – Small brown spot in the 5 cm wide white lower margin left. 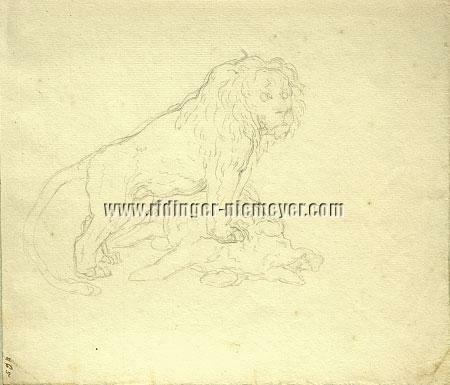 The Animal Kingdom Represented from Original Drawings 2nd Part … Les Animaux representés suivant des Dessins Originels. “The title sheet engraved in copper, reddish-brown … ” (Th. 1033). – In the white margin minimally to a bit more tidemarked. The Polecat. / The Marten. Furet. / Mart. At an ambience of boulders overgrown with shrubbery the former plundering a duck’s nest with three chicks dashing away, the latter posing with a bird in the mouth. – Th. 1053. – See the complete description. Hound Badger. / Hog Badger. Thaison canin. / Thaison de pore (sic!). “There are two badgers of one species (there are no more in our parts), the one creeping up, the other blubbering at him” (Th. 1067). In scrubby hill landscape before a badger’s earth. – Various (quite) faint tiny fox spots in the white text/plate field. – See the complete description. AI BRASILIENCIA et MEXICA – A Monkey with 3 Claws. / The Slow or lazy little Monkey. Singe avez trois Ongles. Singe paresseux ou tardif. Both times the sloth . For once sitting chained to a block the Pale-Throated Sloth, behind this on a palm the Unau looking down to it. Before the block pumpkins. – Th. 1039. – Acid-freely backed 2-cm tear in the white margin upper left and outside the subject partially mostly just faintly age spotted. – See the complete description. Ant Eater / Guaku and Miri. Tamanoir. “Supposedly among these quite queer names the Capian Aardvark … but this species one has transformed into two … and both worked from imagination, at discretion. Such animals are nowhere” (Th. 1041), related, however, to the Anteater. – In the white paper margin partially faintly stained and a little spot carefully acidfreely backed far left. – Very painterly . – See the complete description. Ant Eater = / particular Scaly Animal =. Fourmiller = / Quogelo =. “Long-tailed pangolin … colored verdigris-green, like a lizard, should appear brown, colored like fir-cones. 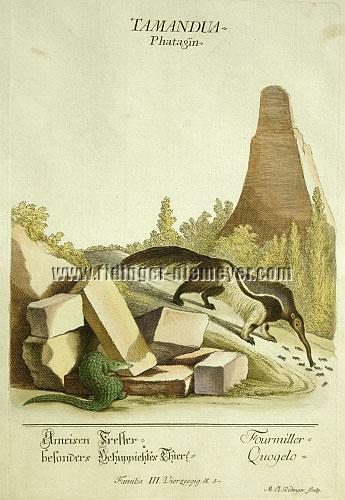 The illustration of the Giant Anteater … quite well-made” (Th. 1040 with deviating designation). – Isolated faint (little) stains in the white plate/paper field and far left of the latter a little weak spot carefully acidfreely backed. – See the complete description. Shield Piglet or Armor Animal. Cochon écaillé ou cuirassé. “Which Armadillo a) shall depict I am unable to determine, b) is the Brazilian three-banded armadillo” (Th. 1042; endemic to the northeast of Brazil and rarest species of armadillos). – Some small brown stains/spots almost only in the left white paper margin. – See the complete description. The Marsupial =. Sarige, Carigueia Americain. 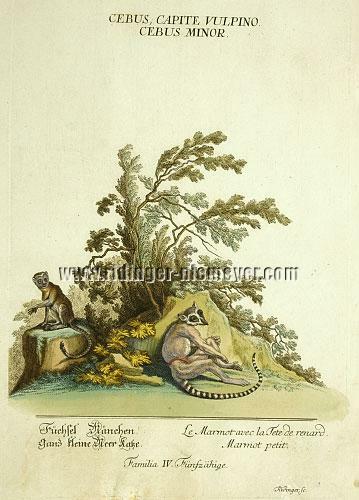 “It is the white-headed Virginia Opossum (Didelphis virginiana), illustrated not bad at all with two young ones” (Th. 1050). Big front right, resting. A moving further one (of another species?) on the left separately. – Some also somewhat larger brown spots in the white text field. – See the complete description. Genet Cat. / COATI, GENITTA HISPANICA. Le Chat d’Espagne. Famous for its fur, attentively on flat rise before shrubbery to the left. 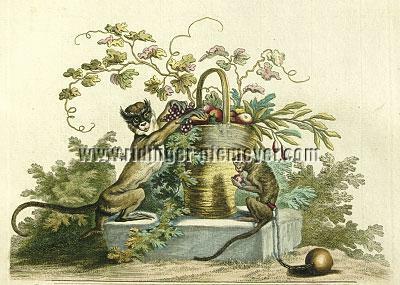 “The name Coati is not due to it, also it should not be called cat, for it … has nothing (so not correct, as viverrid it belongs to the feliforms) in common with the cat” (Th. 1065). – A few also somewhat larger brown spots in the white text field. – See the complete description. Civet Cat. La Civette. In charming light ambience, sneaking to the left. – Th. 1066. – Some brown spots in the white text/plate field. – See the complete description. House Cat. Le Chat. “It origins from Egypt and not at all from our wildcat … In a kitchen resting on a chopping block. In front of it two young ones play, which, however, turned out far too square” (Th. 1068). – 1.5-cm tear in the right white far margin, in the wider left one faint little brown stain and some spots. – See the complete description. “ With respect ( to the following ) beasts there is a frequent contradiction with the writers themselves and quite often they have confused with each other the leopard, the panther animal and the tiger. In recent time many such animals have been brought to Europe indeed … However, since for our part we do not dare to decide due to a lack of sufficient and convincing first-hand experience, we have presented this species of animals here just as we have seen it from time to time … Thus we have tried to make it as well as was possible for us and feel compelled to ask for forbearance if we should not have fully satisfied all expectations ” ( the Ridingers in the preamble ). A couple Panther Animals. Pantheres. “A light-colored and a rust-reddish one are about to attack each other. The bone of contention is a bird which lies murdered between the two. The representation well-made” (Th. 1071). – Faint tidemark on the back showing through quite minimally in the lower white text/paper field. A Leopard. Leopard. 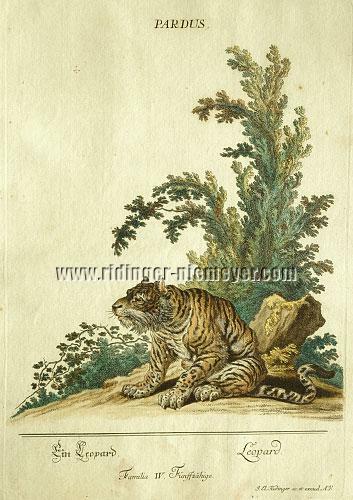 Recte Bengal or Indian tiger. “This is the Bengal tiger with stripes. It sits somewhat huddled (to the left) and the strong beard mars it a bit, otherwise recognizable” (Th. 1074). – Faint tidemark on the back along with little discoloration stains faintly showing through in the lower text/paper field. – See the complete description. A Tiger. Tigre. “… the ground light rust-colored, thus far from being a true tiger … and I rather suppose it to be a young Panther” (Th. 1073). Chained in front of its house, noticing something on the ground. – Two little tears in the white paper margin upper left backed acid-freely, isolated spots outside the picture, two smoothed fold traces in the left lower plate/paper field. Dark Tiger. Tigre d’une couleur tombre. “It also seems to be a Panther, only darker … A tiger is out of the question here. A fine male , lying felinely , with collar” (Th. 1072). – Faint tidemark in the lower third of the back showing through minimally only and only in the white text/paper field. Paper edge top and lower left slightly age-smudged, dog’s ear upper right. Whitisch Tiger. Tigre blanchatre. “It is the American Lion, or the Cougar (Puma). Klein calls it the American Tiger. It leaps up at a boulder and we see it furiously from behind” (Th. 1075). – Quite faint tidemark on the back quite minimally showing through in the lower white text/paper field. Furiously leaping up at a boulder, the position of the beast is quite related to Th. 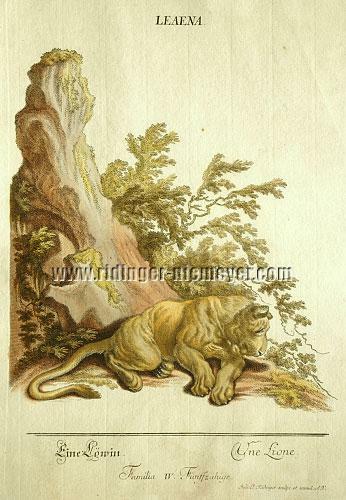 718, the “lioness assailed at her young ones by bear” as plate 3 of the sociopolitically highly charged first four plates of the already 1856 for Thienemann rare 8-sheet SET OF THE BIG FIVE , the Fights of Killing Animals. – See the complete description. In which by plates 1-4 Ridinger & Brockes keep up with their boldness and in anticipation of the epoch of the Storm & Stress take per most artfully wrapped wrapping an imaginably aggresssive intellectual & sociopolitical pre-1789 credo. Comparable for instance with Vredeman de Vries’ etching The Massacre of the Roman Triumvirat as an allusion to the “unjust and arrogant conduct of the Duke of Alba” in the Southern Netherlands. “The political explosiveness of the sheet explains why in the first state Vredeman is not quoted as designer” (Thomas Fusenig in the Brake/Antwerp exhibition catalog Hans Vredeman de Vries und die Renaissance im Norden, Munich 2002, cat. no. 123, page 286). Lower 9 cm on the back with partial faint, reddishly discolored tidemark, showing through to the front only slightly obtrusively in the text/paper field. – See the complete description. on Christmas Eve 1766 . Black chalk. 4⅞ × 6½ and 4⅜ × 5¾ in (125 × 165 and 110 × 145 mm) resp. Sheet size 8⅜ × 9¾ in (212 × 249 mm). – 1979 singularized by inconsiderate dealer’s hand of otherwise first address, research here led through 1976 and magnificent provenances of 1895 & 1869 back to the master himself. A Lioness. Une Lione. “She lies and has the full attention turned to an object moving before her. Quite light yellow ocher” (Th. 1078). – Lower 9 cm on the back with partial quite faint tidemark showing through to the front barely obtrusively in the text/paper field. In the left lateral margin tear extending up to the subject/platemark, at the left lower paper margin besides dog-eared on 7.5 cm, both backed acid-freely. – Wonderfully sympathetic sujet . – See the complete description. A Lion of Darker Kind. Un Lion, d’une Couleur brune. “Mane dark, fox brown. Old male” (Th. 1077). Lying to the right, but looking intently to the left outside the picture. – Lower 9 cm on the back with partial quite faint tidemark showing through to the front in the text/paper field. – “In Syria in particular even utterly black lions are said to be found” (from the preamble of Ridinger’s sons). – Majestic . – See the complete description. 1. Gibon , Monkey going errected … or called Wood Man. / 2. Coaita … the especially long tailed black Sapajous … / 3. Along with another small Species of Guenon. 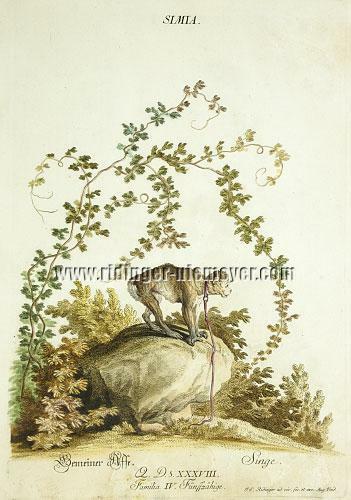 Gibbon ou l’homme sauvage / Signe araignée genant, avec une petite guenon. – Th. 1084. – Lower text/paper field partially with tidemark showing through from the back slightly more distinctly only below the caption as also a trifle thin in the paper. Common Monkey. Singe. “The only monkey which is to be found wild in Europe (Gibraltar)” (Th. 1085). On a boulder to the right with loosely drooping neck leash. – Severe water stain in the lower 11 cm of the back showing through on the front only as uniform faint browning of the text field, more distinctive only below of the same. Wood Devil. Le Satyre. 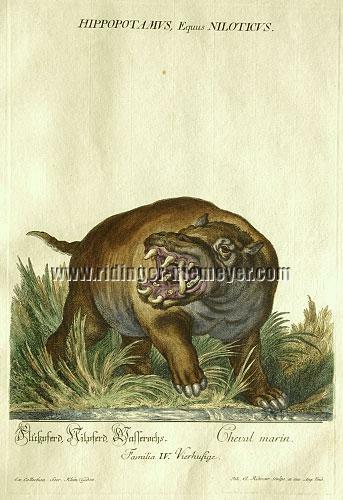 “Is a well-made illustration of Cynocephalus Mormon. The Mandrill is the same monkey young” (Th. 1086). – Severe water stain in the lower 11 cm of the back showing through on the front only as relatively faint browning of the text field, more distinctive only below of the same. A Masked Monkey from Guinea. Singe masque de Guinée. “It is the Cynocephalus of the old, now called Grey Baboon … old” (Th. 1087). Walking to the right, looking at the beholder. – Severe waterstain in the lower 11 cm of the back showing through on the front only as relatively faint browning of the text field, more distinctive only above and below of the platemark. Lion Guenon, Man Tiger. 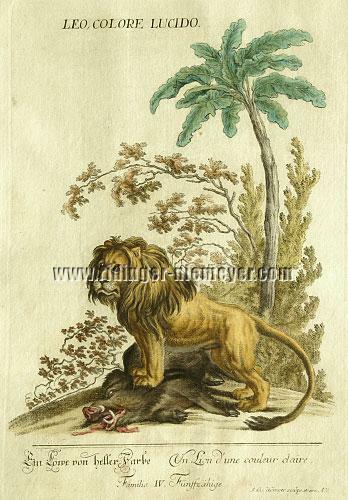 Marmot qui a le Tete d’un Lion. “Is nothing but a young one of the previous species (Grey Baboon), somewhat emaciated” (Th. 1088). Sitting easily against a boulder, keeping the beholder in sight. – Severe waterstain in the lower 11 cm of the back showing through on the front only as faint browning of the text field, more distinctive only above and below of the platemark. A Bearded Monkey. / A Bearded Guenon. Singe barbu. / Le Marmot barbu. Sitting on and beside a boulder resp., both keeping the beholder in sight. – Faint partial water stain in the lower 9 cm of the back perceptible on the front practically only below the platemark in the white paper margin of 5 cm as smaller stain and a bit thin in the paper. – Th. 1089. – Very painterly . Greenish Monkey. / Yellowish ditto. Le Marmot Verd. “Belong both to one species, called the vervet monkey” (Th. 1090). The former, chained to a ball, dignified in its appearance, the latter sprightly, as if looking for advice, opposite to it. – Moderate partial water stain in the lower 9 cm of the back perceptible on the front only little in the text field, a little more distinctive below the platemark in the white paper margin of 5 cm. – Charming sujet . Great Bearded Guenon with Small One. Le Marmot grand barbu avec ses petits. 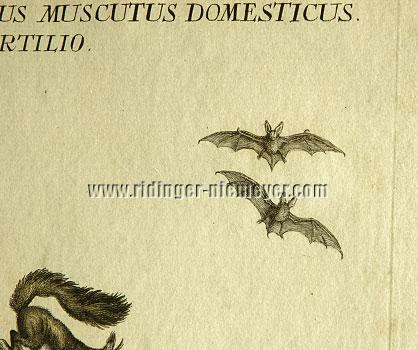 “… uncertain to which species it shall belong to … Ridinger describes them as old and young. In some copies I find the face of the supposed young one black, yet in others – so here, too – flesh pinkish. In correspondence to the latter it might be Cercopith. cynomolgus” (Th. 1091). – Both regaling themselves with grapes and apples (? ), yet vigilant of the beholder. The small one chained to ball. – Faint/moderate partial water stain in the lower 9 cm on the back perceptible on the front practically only below the platemark in the white paper margin of 5 cm as stain of 1⅛ × 1⅝ in (3.5 × 4 cm). – Painterly sujet . Tiniest Guenon. Marmot Sagouin. – Th. 1092. – Water stain in the lower 10 cm of the back perceptible on the front only as evenly faint browning of the text field and a little more distinctive partially below the platemark in the white paper margin of 5 cm, besides a little thin in the paper there. Ring-tailed Lemur. / Really Small Guenon. Le Marmot avec la Tete de renard. / Marmot petit. “a) The Dwarf Lemur is colored flesh pinkish, rather should be ashen” (Th. 1093). – Moderate partial water stain in the lower 9 cm on the back perceptible on the front a little only in the text field, a little more distinctive below the platemark in the white paper margin of 5 cm, besides a minimal thinness in the paper there. At the lateral far paper edges a few faint little brown stains/spots. – Charming sujet . (indeed ditto the guenons) of the same size & partially adding to each other Th. 541-550 in black & white. As completely as apart just as rare as the Animal Kingdom. So in the mid-90s that Ridinger collector assoluta acquired these, too, only and solely by purchasing here just this one of the two Pompadour-Marjoribanks Folios of Gutmann provenance. Voilà , you can have it easier! 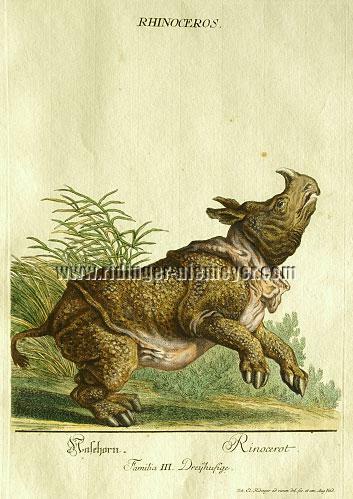 “ as a skilful showman he published fair flyers and engravings with descriptions (‘about 1745 he probably was the first who had his name been mentioned on engravings of the rhinoceros ‘Maid Clara’ by which he deliberately stepped out of anonymity’, Rieke-Müller) … Interestingly enough that for the greater part of these graphic depictions of the rhinoceros worked in the 1740s one orientated oneself by Dürer’s famous woodcut of a rhinoceros of 1515 (Hollstein, ill., & Meder 273; Catalog Darmstadt p. 24 with ill.). 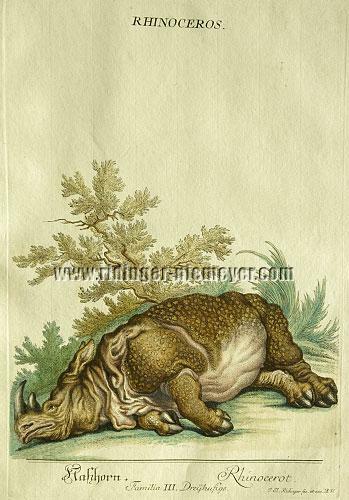 This is not surprising in that Dürer’s depiction was copied again and again in the zoological works up to the 18th century and therefore had a lasting effect on the idea of the animal’s appearance. in the height I found her 5½. in the length 11½. feet, of color she was dark brown below at the trunk at the breast and in the depth of the folds superimposed upon each other she is broken reddish …” to add her, standing to the left, hot off the press to his Representation of the Most Wondrous Deer as well as Other Particular Animals published in numbers as first scientific portrayal of the rhinoceros and therefore a milestone of zoological knowledge (Th. 295; cf. nos. 50-55 of the Ridinger appendix of the catalog of the bequeathed drawings of 1869). But for now just in black & white ! published two of his further Clara drawings for the first time . And now in color ! a highly sought-after collector’s item . So the preparatory drawing intended for the transfer to the plate for the b&w sheet Th. 295 (Weigel 54) rocketed during its sale at Sotheby’s, London, 1991 from estimated 2-3,000 £ to 20,000 £ for the Ratjen Collection, Vaduz (acquired by The National Gallery of Art Washington in 2007). It originated from the 95-sheet drawing corpus of the Ridinger collection Counts Faber-Castell, which in their sale 1958 was paid for as a whole, including two further rhinoceros drawings (! ), at 7800 (!) German marks. And still more recently in a German sale a copy of the b&w print Th. 295 was bid, doubling the estimate, to a final price of well 1850 euro! (Annelore Rieke-Müller in “‘a Guy with Wild Animals’ – On the Social Position and the Self-conception of Animal Leaders in the 18th Century” in The XVIIIth Century, as above, wherein R.-M. also calls attention to the competition of such urban events towards the courts, just as then the French court would have acquired “Maid Clara” only too gladly for its menagerie at Versailles, yet had to forgo due to the great costs for such exotic animals, 100,000 ecus for the same, 2000 guilders for an elephant in 1690.
on the European continent ! IN ALMOST , INDEED , VIRTUALLY DEWY CONDITION . 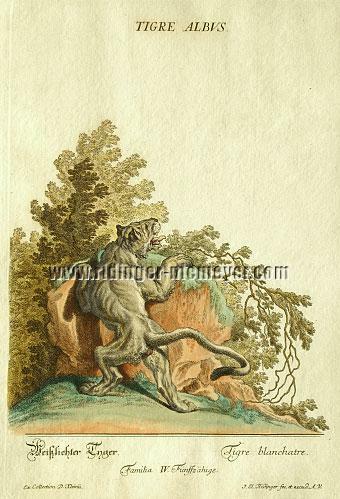 “ It is a quite well-made representation, leaping , and excellently colored . It is a pity it is so little known and used for scientific works ” (Thienemann 1856). The aspect of an “increasingly natural history curiosity” becoming in vogue claimed by R.-M. for the 2nd half of the century and proven per 1775 ff. Ridinger had incidentally anticipated – as just another example – already 1744 per title to his Fable set. Rhinoceros. Rhinocerot. Asiatic Rhinoceros. Before reed and tree scenery leaping to the right. – Th. 1027. – See the complete description. Rhinoceros. Rhinocerot. Ditto sprawled to the left. – Th. 1028. – See the complete description. 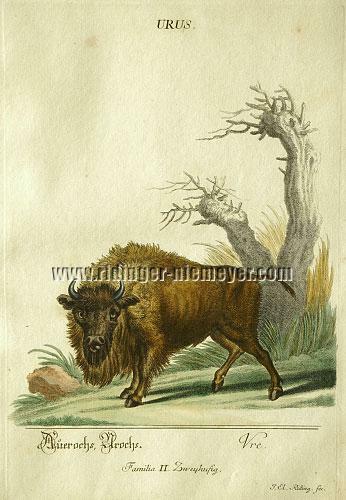 Aurochs (recte Bison/Buffalo). Vre. Vigorously laterally to the left, aiming at the beholder. – Th. 989. – Isolated faint brown spots not worth mentioning at the very top in the white plate/paper field. “ Since the 17th century it was confused with the aurochs, which frequently occurred beside it, but became extincted much earlier. (Meyer’s Convers.-Lex., 4th ed., XVI, 693 and correspondingly already II, 48). Lap Dogs, or Truffle Hound. Bichous. Four of them. “Neither shape nor color represent the true pug. With one of the Bolognese the tail does not look good. The lion dog is utterly wrong” (Th. 1061). – Faint little brown spot visible outside the scenery in the white plate field. Grey and Dachs Hounds. Levriers. 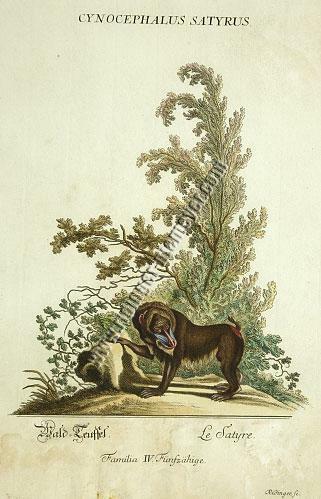 “A wire-haired and flat-coated greyhound, a light and dark dachshund, each two coupled, look quite good” (Th. 1059). – Isolated tiny/little brown spots in the white plate field. Par Forcè Hounds. Chiens de Chasse par forcè. Four of them in various positions and colors, nicely arranged. – Th. 1058. – Somewhat larger brown spot in the upper left white lateral margin. Water Hounds, Pomeranian and Poodle Hounds. Barbets. “A large and a small poodle (without similarity to the present ones, whose ancestors were just working dogs for the hunt, particularly the water fowl hunt), a real Pomeranian and an otterhound (Th. 1060). – Quite faint smaller brown spot in the upper left lateral margin. Boar Dogs / Peasant Dog / Great Dane. Chiens de Chasse des Sangliers. One each, the former two of which with collar, standing and scenting sharply to the left, in-between the Dane, lying. CANES PORCARII / Chiens de Chasse des Sangliers. – Th. 1056 & appendix page 298. 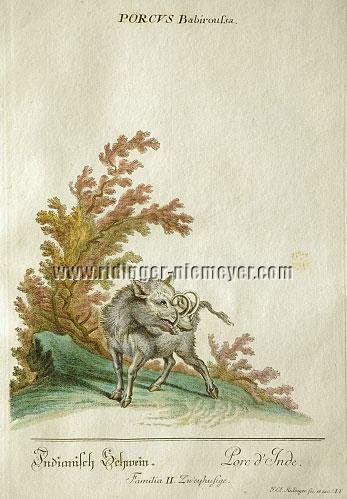 Initially, Thienemann “had not set eyes on” present first edition of this especially rare plate of three four-legged boar hunters, Latin , German , French . If Beethoven’s Ruins of Athens are absolutely the yolk may be left undecided. Doubtless ruins , however , the now following sheets of the Animal Kingdom offer, on which the predator time has regaled. Nevertheless: where we draw pleasant satifaction from the coloring, there the white margins decidedly met the gustatory nerve of that art contemner, remained the pictures themselves still tolerable. But read , decide yourself . Beaver. Castor. “It grazes and holds its scaly tail into the water” (Th. 1095). One of the four sheets of the set printed in green and additionally colored. – Text field & white lower margin relatively faintly, on the back more, waterstained. Fine trace of a 4 cm tear at the lower platemark backed acid-freely. The pictorial effect still almost flawless, particularly matted as being delivered. – See the complete description. As the one before – “both quite appealing sheets” (Th.) – one of the four sheets of the set printed in green and additionally colored. – Down from the lower text field mould stained/traced, on the right trimmed to platemark. The pictorial effect still almost flawless, particularly matted as being delivered. – See the complete description. Walrus. Cheval Marin. Lying to the left on the beach, showing two yard long tusks. “If the animal really looked like this, it were indeed no beauty. However, it is worked from a specimen distorted by stuffing and therefore wrong” (Th. 1096). – The severe water stain of up to 13 cm on the lower back strongly penetrating the text and particularly the paper field of 5 cm, in consequence the latter also with fissure damage. On 1⅛ × 2 in (3 × 5 cm) faintly water stained besides the white plate/paper field top right and the upper far edge. After covering of the essential damage at the lower margin by passe-partout, as being delivered, pictorially still quite proper. A Sea Calf. Veau Marin. “Is a well-made illustration worked from nature” (Th. 1099) of the monk seal. This lying ashore to the right. At the open sea on the left three one and two-masted boats resp. – Severe water stain of 13 cm on the left of the back penetrating the front quite fully, left upper corner partly up to the platemark fissured with losses. Further margin tears and partial loss of also the right lower corner, but outside of the still complete inscription. The picture itself including the caption yet ultimately still utterly unimpaired and by passe-partout, as being delivered, quite presentable. Harbor Seal. Veau Marin. 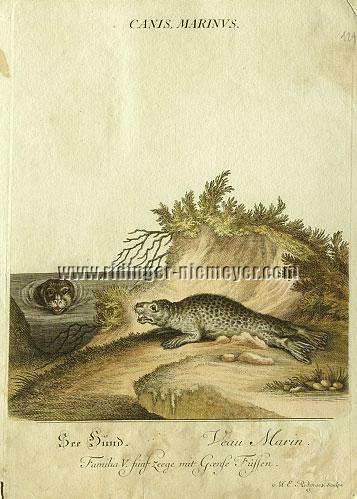 “The common seal from an illustration of Klein’s is depicted well , once completely from the side, then the head from front in the water” (Th. 1098). – Margins on three sides 1.4-2.5 cm wide, below trimmed to platemark and defects in the white paper margin of up to c. 2 x 2 cm backed acid-freely. Waterstains on the back of up to c. 8 cm below, 5 cm laterally upper right visible on the front only in the text and white paper field. Backed dog’s ear top right, faint small brown spot in the paper margin upper left, far top edge feebly tidemarked. The pictorial effect of the decidedly charming motif ultimately unimpaired. – See the complete description. 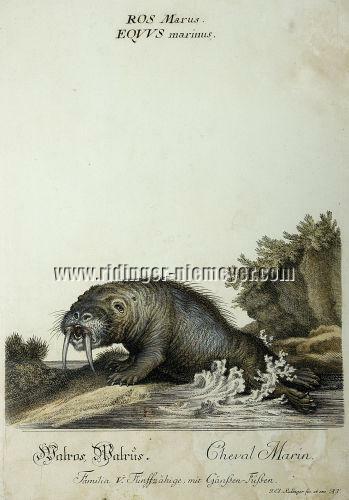 “The larger figure is the distorted Hooded Seal or the Elephant Seal … the male, from Anson in his voyage (1740/44) around the world (first edition London 1748). The smaller one supposedly is the female, colored (here rust red) wrongly”. – The severe waterstainedness on the back more or less perceptible on the front only by slightly larger scattered mould stains, but on the left marginal loss into the lower lower margin right up to the edge of the picture. Besides tears in the otherwise largely preserved lower margin. Right far edge with faint tidemark. The caption completely preserved up to the inscription and aforementioned beautiful final line. By passe-partout, as being delivered, still quite presentable. (A Crocodile with the Comb Back. Le Crocodile.) Lying to the right. “With opened jaws, not bad” (Th. 1100). – Absolute torso due to loss of the text field still close into the subject. Large corner/margin tear off also upper right along with adjacent faint waterstainedness of 1¾ × 3½ in (4.5 × 9 cm). The plain picture, instructive and charming, almost intact and by passe-partout, as being delivered, ultimately still satisfactorily presentable. Their number of copies cannot be assumed small enough. And only seven years after publication of the posthumous complete edition of the Animal Kingdom with Martin Elias the one of the two sons more familiar with the œuvre passed away.